Although there’s plenty of intrigue in 2019’s top ten. Last year’s top seven have all been returned to their spot atop The Roar AFL Top 50, although positions have shuffled a bit. Meanwhile, the eight, nine and ten spots include one player who didn’t make the 50 last year, and two others who’ve been rewarded for stellar recent bodies of work. More or less every player here was a unanimous pick inside the top 15, and once you see the names I think you’ll agree we’re more or less on the money here. If you’re just joining us, here’s how we got here. Last year’s Coleman medallist and eventual leading goal kicker, Riewoldt has been rated as the best key forward in the game (Lance Franklin’s position is ‘Lance Franklin’ for what it’s worth). 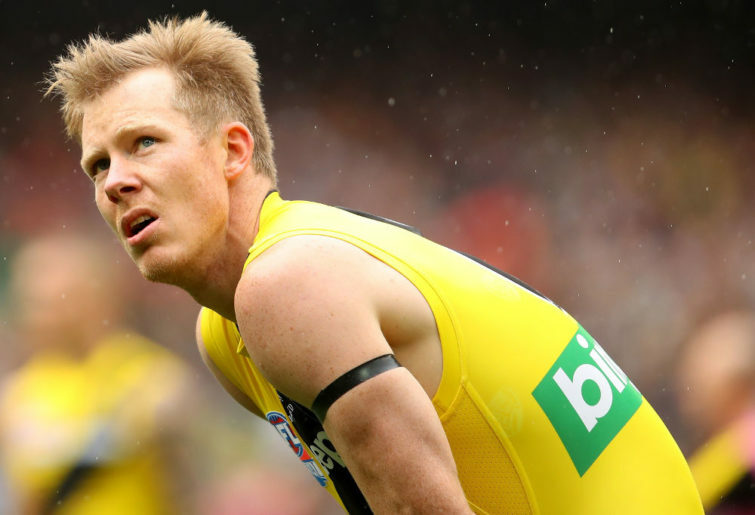 It caps a stunning half decade for the Richmond champion, who has shed his former petulant reputation to become one of the most respected players in the competition. Riewoldt’s strength is equal parts his nous and his work rate, personified in his performance in a losing preliminary final (where I would’ve rated him best on ground). 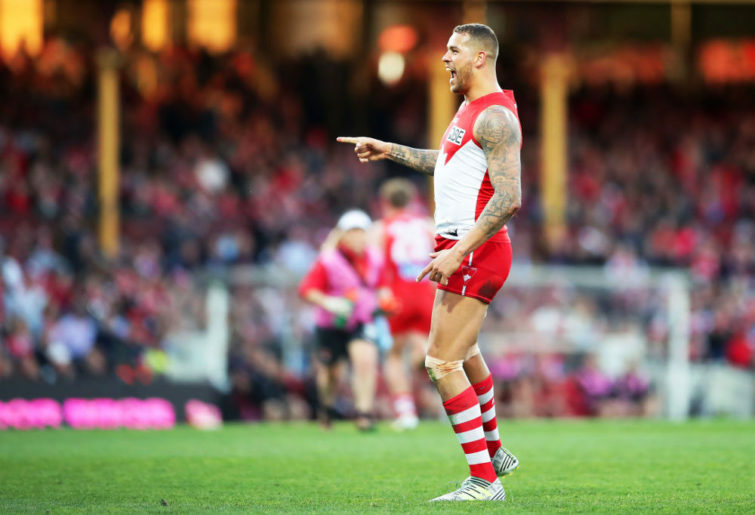 His 10.6, 26-disposal game in a rout against the Gold Coast was another highlight of his 2018, particularly given he nabbed the last of his bag with less than a minute on the clock. This year we’ll get to see Riewoldt go to work with a genuinely threatening partner at centre half forward – I think you play Riewoldt as the deepest threat given Tom Lynch’s mobility – which might see his measured output dip a little. But those in the know will still revel in his work. A future Brownlow medal candidate – if he can mature his mind as fast as he’s matured his game – Clayton Oliver has surged from 38th on last year’s list to a spot well inside the top ten. I think he’s on track to Brownlow contender level in 2019. I ranked Oliver as the fourth best player in the league heading into the year. The rest of the panel was more circumspect, having him in the early to mid teens (without my score Oliver would be ranked between Stephen Coniglio and Patrick Cripps). Why? Have you seen this guy’s handle? I’m hesitant (not) to cross over into alternate sports for metaphors, but Oliver is about as close as you can get to a Kyrie Irving-style point guard with the ball in hand. He makes the Sherrin sing, which is some feat given footballs don’t have a mouth or brain. He would be odds on to break the 30-disposal barrier next year having gone close in both 2017 and 2018. I also think he’ll be one of the top beneficiaries of the league’s new centre bounce rules; we might get to see some more set plays come his way, and he can show off his skills with more time and space. We think the All Australian panel got it wrong. Collingwood’s Brodie Grundy has been rated by the panel as the preeminent ruckman in the competition heading into 2019, although there was disagreement. I had Grundy (9) above Gawn (10), Jay had Gawn (6) above Grundy (11), Josh had Grundy (8) well above Gawn (21), Adrian had Grundy (13) just above Gawn (14), and finally Cam had Grundy (10) above Gawn (14). Jay’s Gawnism offset Josh’s Anti-Gawnism, and here we are. The panel likely went the way it did because of Grundy’s raw output. Despite racking up the second most hitouts in the league, Grundy averaged more touches than 533 of the 658 players that played at least one game in 2018. Disposal counts don’t do his influence justice though; in Grundy, Collingwood has an All Australian ruckman and a quality, reliable midfielder in one body. For what it’s worth, this is where I guess Hawthorn’s Tom Mitchell would have placed if he were eligible for selection. Hopefully I’m not breaking the panel’s confidence here. After yesterday’s top ten predictions from the crowd, it was noted there was no mention of one Marcus Bontempelli. Well, here he is, in at number seven. 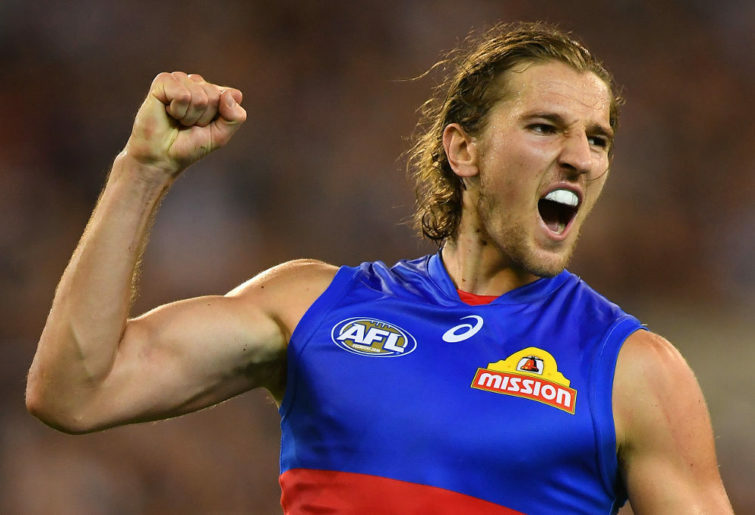 The Bont is the AFL’s new young Scott Pendlebury; an early-career underrated player because his counting stats are lower than some of his peers. Bontempelli’s worth isn’t captured on the stats sheet, because he does things with the ball that don’t earn him anything more than an effective kick or handball. He’s a Swiss army knife offensive player, who just needs his coach to decide his best position is in the guts rather than as a timeshare tall forward. Hopefully for us all this will be the year Dogs’ coach Luke Beveridge shows us the weird experiments he’s been running for the past two years were part of some grand design. If so, the Dogs are a sneaky finals contender if you ask me. The in-demand dynamo, Josh Kelly once more comes up just short of the current pantheon of AFL players. There’s not much that needs to be said about Kelly, other than he is a complete modern midfielder who still plays like he has another gear or two in him as he hits his prime. While we’re talking about Kelly, can we all agree to stop pretending to be shocked when high quality players sign short-term deals that get them to free agency? That’s precisely what Kelly is going to do in 2019 – sorry North – because he knows in his 26-year-old season he’s going to be one of the best handful of guys in the league, and he will command that same seven-year deal the ‘Roos have been putting under his nose for the past few years. He’s another candidate to leap into the 30+ disposals club, and he might do it averaging more than a goal and a goal assist a game. Kelly is a special player. Buddy has fallen from his previous status as a top three lock, mostly on account of his recent struggles with injury. Unfortunately everyone ages. Still, when he is fit and firing – idle speculation time: Sydney is going to be extraordinarily cautious with Franklin this year so they can get another two or three years of play out of him from 2020 – there is no player in the game who you’d rather have with the ball in hand. We are getting to the point in Franklin’s career where we can start cheering for him to reach a bunch of milestones. Having entered the top ten all time goal kickers, and leaped over Leigh Matthews into eighth spot, in 2018, Franklin needs nine goals to pass Matthew Lloyd and reach seventh on the all time list. He needs ten games to reach the 300 milestone and 15 more wins to become the 25th player to 200 wins. There is no greater play in football than Buddy on the left forward flank. Cherish it while we still have it, because it’s clear the end is coming within the next few years. There’s a new test that can, with 100 per cent accuracy, identify a football fan who thinks they know more than their peers about football. It’s called the Alex Rance Test. Just say the name “Alex Rance” – no context required – to your test subject, and listen to the response. If the first sentence has the term “overrated” baked into it, the subject has failed. Hating on Rance has become the go-to avant garde football take, because apparently the fullback of the century – all-time? – doesn’t actually defend. Boy have I got a statistic for you sad, hopeless people. Alex Rance was involved in 154 defensive one on ones last season, and conceded a goal on 12.2 per cent of them. That’s the most defensive one on ones, and his rate of goal concession was below the league average of 14.4 per cent. But it gets better. How many defensive one on ones did the second placed Harris Andrews participate in? 101. How many defensive one on ones did David Astbury and Dylan Grimes participate in combined? 117. COMBINED! Go away with your Rance takes please. The 2016 Brownlow medallist retains his spot in the top three unanimously, a sign of both his consistency and excellent play as one of the most damaging midfielders in the competition. There’s no real way of arguing against the notion he should be second or first on this list; it’s like deciding the drop you’ll pick up at Dan Murphy’s for the weekend. 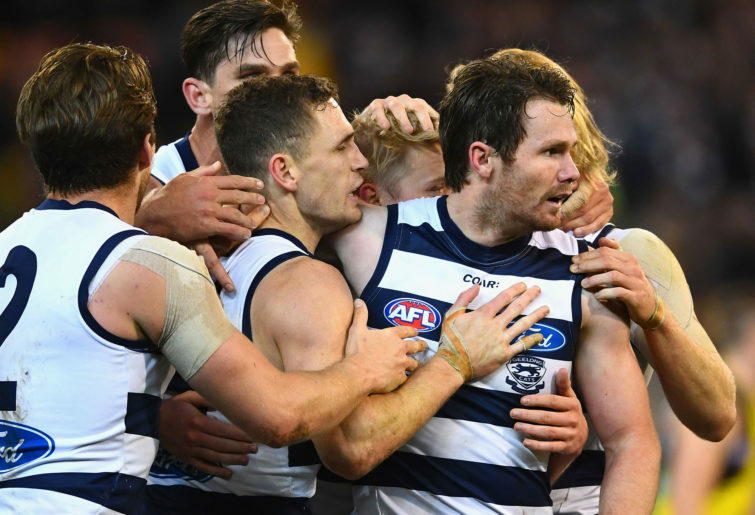 Patrick Dangerfield has shouldered an increasingly large load for the Cats since joining ahead of the 2016 season, with the decline of Joel Selwood and the up and down play of many of his teammates. That he can carry the burden of running point through the middle but then head forward and kick two or three goals as a centre half forward speaks volumes. Dangerfield is crucial to Geelong’s prospects in 2019. You could say that about most players in the top 20 or so, but for him it feels like the stakes are a little higher. The Cats sputtered at the back end of last year; Dangerfield is the player to spark the club and keep them in the premiership conversation beyond the first month of the season. 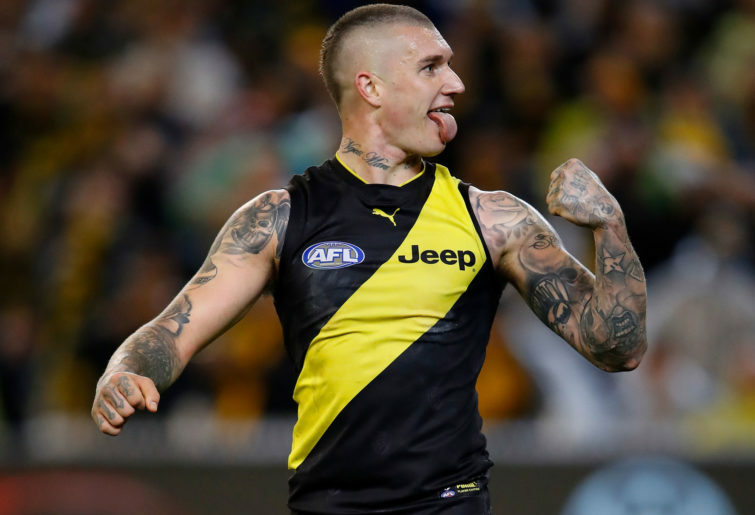 A year atop The Roar AFL Top 50, and Dustin Martin has dipped back down to second place. Like Dangerfield that’s no real knock on the lad, he’s clearly one of the most damaging players in the league: a unique threat bursting from stoppages and one out on the ground inside 50. Like a lot of other players we place in these lofty heights, Martin apparently had a “down year” last year. If he had a down year I’d have loved to see what would constitute an improvement. Martin’s numbers are obscene. 25 disposals, 12 contested possessions, nine score involvements, three centre bounce clearances and six inside 50s per game; throw 1.3 goals on almost three shots a game and he’s close to a complete offensive weapon. One suspects he will enjoy not having players running towards him as he breaks from centre under the new centre bounce starting position rule. We could see plenty of long shots for goal if he gets a clean look. The return of the king. 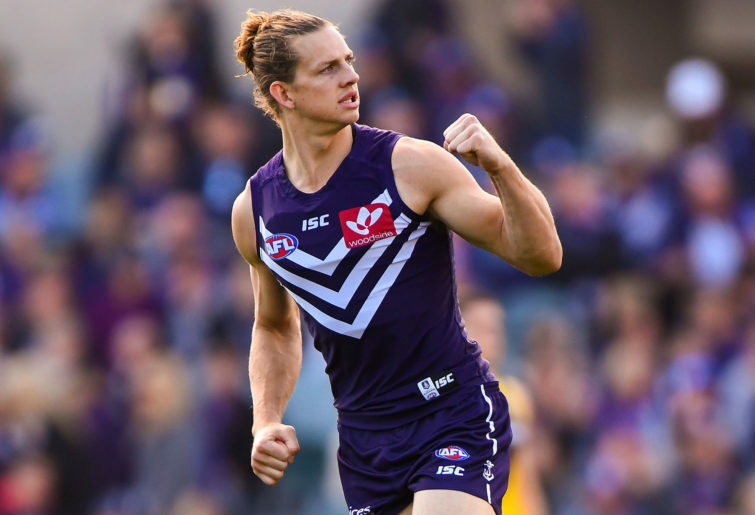 Nat Fyfe, football man-god, sits atop the throne once more. As an aside, Fremantle didn’t have another player in any individual’s top 50. Fyfe’s return from a double leg break took the best part of two years, but after his 2018 season there is little doubt he is the best player in the game according to our panel (for what it’s worth I had him in third, penalising him a touch for his heightened injury risk. If injury was not a thing, he’d be my number one). He ended up fourth in last year’s Brownlow Medal count on a votes per game basis, conservative management of a few niggling injuries costing him seven games last year (not that he was eligible for the Medal anyway, after a suspension). This year he has had no material pre-season interruption – an elbow bursa doesn’t stop you from doing much I understand – and is set to rock the league once again. The best Nat Fyfe Stat continues to be his extraordinarily outlier contested mark number. He averaged 1.5 a game last season, while averaging 29 disposals, 6.7 clearances, 16 contested possessions and four tackles. The players who took more contested marks per game collectively averaged 13 disposals, 0.6 clearances, 6.5 contested possessions and two tackles. And that’s a wrap! The AFL season is less than three weeks away, make sure you check in on The Roar’s AFL vertical every day for the best independent football analysis and opinion.